Concerned about textbook affordability? So are we! Listen to our Podcast to find out! Open Educational Resources (OER) are accessible, open-license documents or media that can be used for teaching and learning. OER are generally offered under more flexible intellectual property licenses, such as the Creative Commons. Open Educational Resources are generally low or no-cost and include free and open-source software. Academic Technology Services has compiled a dynamic list of Open Educational Resources for you to explore. If you currently use a resource not on our list, please contact an instructional designer and we will update it. OER Clue Game - teach your faculty, staff, administrators about OER! 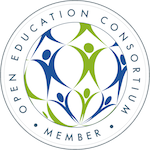 Minnesota State University, Mankato is now a member of the Open Education Consortium, a collaborative network of educators and professionals dedicated to expanding Open Education options around the globe. Check out their website for resources and tools related to Open Education! What are my options for publishing my own OER? The Minnesota State University, Mankato Memorial Library offers an open-access publishing platform for a multitude of resrouces. Consider Cornerstone for hosting your open materials! What do MNSU students have to say about textbooks? Watch the video to find out! What are some options for reducing textbook costs? There are many options for reducing the textbook costs in your courses other than OER. Talk to a representative from one of our bookstores to see what options they offer.